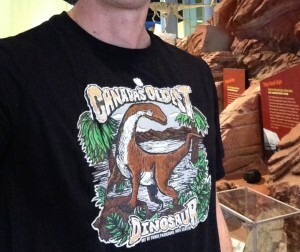 The Fundy Geological Museum has developed a new commemorative t-shirt featuring the Bay of Fundy dinosaurs found near Parrsboro, Nova Scotia. The black t-shirts include a new graphic produced by Halifax Illustrator Geordan Moore (the Quarrelsome Yeti).The high quality Gildan brand shirts are available in a variety of youth and adult Unisex sizes. You can now order your own t-shirt online, using the PayPal button below. If you do not have PayPal account you can use a credit card to complete the PayPal purchase. Revenue from sales support the education and research projects of the Fundy Geological Museum. Select the size you want and then click ‘Buy Now’.